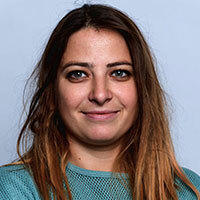 Dr. Tereza Iofciu is a Data Engineer at mytaxi in Hamburg for over a year now. Before, she studied Computer Science in Bucharest, Romania and then did her PhD at the L3S institute in Hanover, with her research focusing on user modeling, tag analysis and entity search. During her Phd she was an intern at Microsoft Research Center in Cambridge. After the academic life she switched to industry, starting with working for the Data Science team at XING. Before mytaxi she took a year off and spent it getting creative with all sorts of art projects involving dinosaurs and co, under the name tiyepyep. Everytime I watch an 1800s movie I realize how glad I am to be alive now. We are surrounded by ever evolving technology to which, like never before, we can easily contribute to and influence. Collaborative, open source and data challenges. Companies are writing their code as open source solutions, which everybody else can use and also improve. Data. I can see data everywhere.